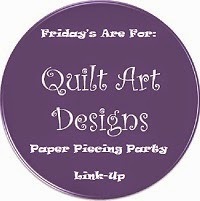 Quilt Art Design: Paper Piecing Party Fridays! Today is Friday - great! no really - GREAT! YAAAY! I've been making all my postcards and birthday blocks this week - having a lot of fun! Oh, I wish I could say I had something to link...but I am REALLY enjoying these fabulous projects, girls! What a wonderful week you've all had! I am just learning piecing the old fashioned way, so I donot have something, but I love the paper pieced blocks.